"The opioid epidemic is intertwined with the story of declining prime-age participation, especially for men, and this reinforces our doubts about a rebound in the participation rate," Mericle said. It's a been a puzzle for economists: Why aren't more people actively looking for work again with the job market so strong? Part of the answer may be opioid addiction, the Goldman report suggests. "The economic consequences of the opioid epidemic extend beyond the labor market," Mericle said. "Recent studies by Birnbaum et al., Rice et al., and Florence et al. estimate sizeable costs of health care, criminal justice, and lost worker productivity," he wrote. "The most recent study put the total cost at $78.5bn in 2013 and the crisis has grown significantly since then, implying substantial costs to both employers and the public sector." In May, the Fed's Beige Book report on economic conditions also noted that several contacts said job applicants could not pass drug tests for employment, Mericle pointed out. CNBC found that other Beige Books this year did not mention that detail. Nearly 13 percent, or 12.5 million, of Americans using prescription pain relievers misused them in 2015, he said, citing the National Survey on Drug Use and Health. "Opioid abuse has been the main contributor to the sharp increase in the rate of drug deaths since 2000," Mericle said, noting drug misuse is more common among men, non-Hispanic whites and those in poverty. To be sure, the economist believes we would be wrong to assume the rise in drug use is only happening with those out of work. He pointed to a study showing prescription pain reliever abuse is only slightly more common for the unemployed than for the employed. 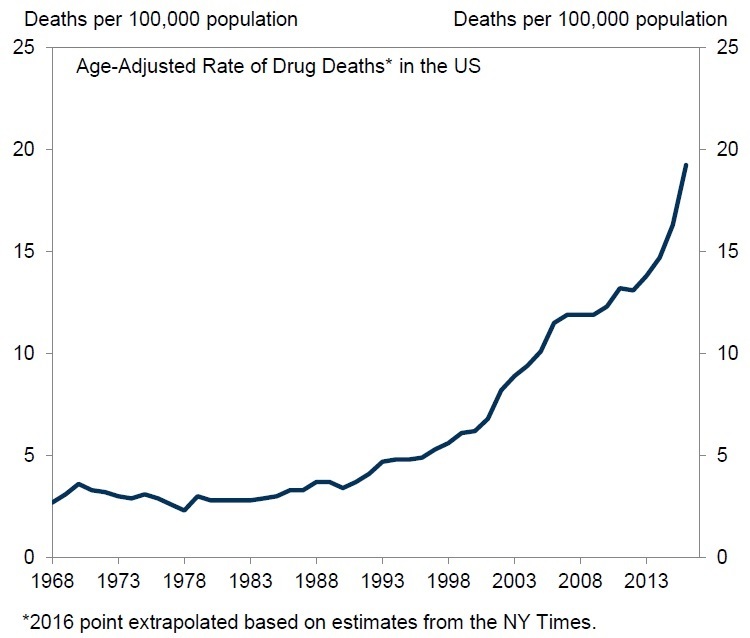 However, it's clear the recession caused by the housing crisis had an effect on the drug epidemic. "The recession likely made it worse," Mericle notes.